This simple, free shooting drill should help your team during attacking soccer games. It is simple, easy to learn and can be very competitive. Both attackers and defenders can gain a lot from this 3 v 2 exercise. - Attacking soccer 3 v 2 is set up with 2 lines of defenders, one line behind each post (be sure they are away from the netting so not to get hit by a shot). - Set your attackers up in 3 lines, approximately 30-40 yards from goal. 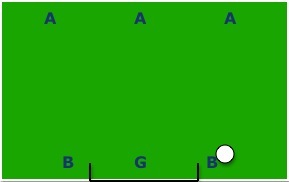 - All balls start from one of the defending lines. - 1 defender plays a long ball to one of the 3 attackers. - 1 defender from each line then sprints and closes down the 3 attackers. - The first player in each attacking line attack towards the goal 3 v 2. - After a goal is scored, or a ball is cleared by the defenders, the play ends and starts over with the next players line. - Be sure to rotate your players through as with any drill so all practice the focus skill area. - Attacking runs should NOT be straight towards the goal, use angled runs both in-front and through in behind of the defenders, but be careful not to go offside! - Straight runs are very easy to defend so therefore should not be made. - Attack should be done at pace to make it harder on the defenders. - Players should be communicating and calling for the ball. - Attacking 3 should not limit themselves into a 1 v 1 chance, that means you are giving up a 2 v 1 elsewhere. - Build to 3 v 3, or 4 v 3 for added difficulty. - Stand with the attacking line and do not let them "plan ahead" what runs they will make, which they will surely do early on with this drill. Preventing the planning of runs makes it more difficult and game like. - 10-15 minutes for these 3v2 attacking soccer drills.